Our Manhattan Pest Control Exterminator will identify the source of the pest infestation & create a customized treatment plan to eliminate the pests. 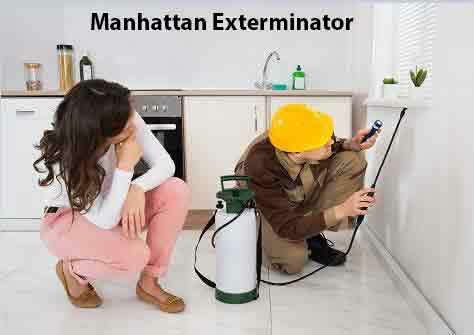 Let us be your Manhattan Exterminator, Give Us A Call Today. 1-844-305-8999. Rats are some of the most troublesome and damaging rodents in the United States. Rats in New York City are widespread, Rats prefer the neighborhoods of Harlem, the Upper West Side, and Bedford-Stuyvesant — and they really like to party in the summer, a new study shows. They eat and contaminate food, damage structures and property, and carry a countless number of diseases. Most importantly are harmful to Humans and Pets. New York City officials say some Manhattan neighborhoods are seeing more rats because of all the development that forces the rodents from their homes. Our Manhattan Exterminator at Dependable Exterminating Specialize in rat control utilizing rat bait stations and rodenticide products. We have the know how to get rid of rats. Give Manhattan Pest Control A Call Today. 1-844-305-8999. The two most common roaches found in Manhattan, NYC are the German Cockroach and the American Cockroach. German cockroaches are more commonly found near dishwashers, stoves and sinks, while American cockroaches are more likely to be found in basements, in bathtubs and near drains. The American Cockroach is commonly referred to as the Water Bug. Roaches are the most common pest infesting New York City Apartments and at a rapid pace. At Dependable Exterminating We Specialize in Roach Control. We have the know how to eliminate your Roach Infestation. Bed bug infestations are increasingly common and New York City tops the list for the most Bedbug Infestations. Bed bugs are most prevalent in apartments and hotel rooms which New York City has plenty of. If you think bed bugs only follow you home from a hotel stay, you underestimate their ability to travel. While they often hitch rides in suitcases, these tiny insects take trips in stored bedding, used furniture and even purses and briefcases. Their round, reddish bodies are almost impossible to see because the nocturnal pests spend their days burrowed into cracks and crevices around the house. You might not realize that you’re dealing with an infestation until bed bugs turn you into a midnight meal. If you have a Bed Bug Infestation or would like an Inspection, Give Us A call Today @ 1-844-305-8999. We provide Visual and K-9 Inspections.